In early spring Bärlauch soup is offered everywhere in Baden-Württemberg. Like the pumpkin a few years ago, we never saw Bärlauch at all on a Gasthaus menu, although German housewives had been using it for years. Now, almost every Gasthaus features it as a specialty of the season, offering it in various dishes. Bärlauch is one of the first wild vegetables or herbs to appear in early spring. 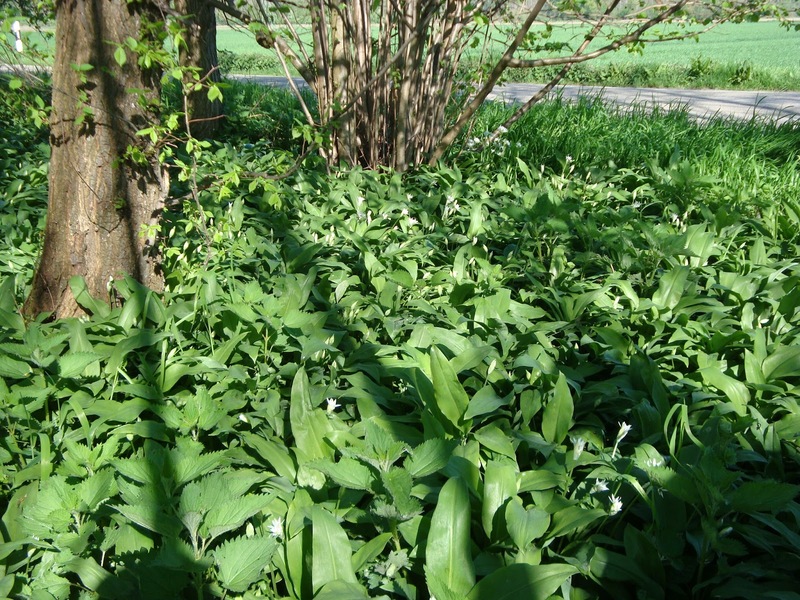 It grows in the woods in March and April here in Germany--often just at the edges of meadows--under hardwood trees with light filtering through. It should be picked before its tiny white flowers are in full bloom. Both Hans and I have picked it and used it as an herb in several things, including soup and pesto sauce for spaghetti. Although its season is now over in our part of Germany, it had been served in Gasthäuser until early May. Those with a later spring should still be able to find and use it. This time last year my sister Paula and I had long discussions via email about this vegetable and what its equivalent was in Canada. I had said Bärlauch looked a little like lily of the valley--a poisonous plant. I also said that it had a tiny white bulb at the root end with a strong scent of garlic. I mentioned, too, how it was used here. Paula answered that it sounded like ramps or wild garlic which could be used in many dishes. 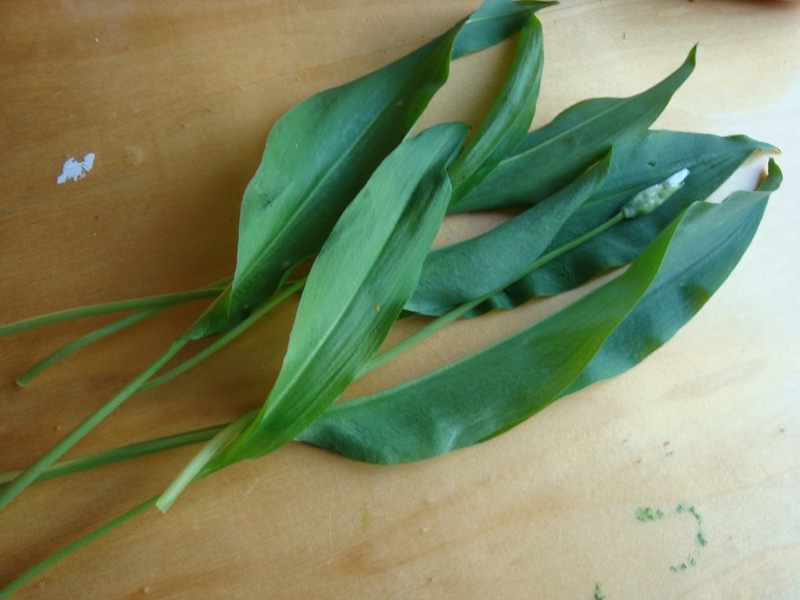 Ramps and Bärlauch are similar vegetables/herbs, both wild and both delicious in various dishes. They are not exactly the same though. They are cousins. Bärlauch's latin name is Allium ursinum. Ramp's is Allium tricoccum. In North America it is sometimes called wild leek, wild onion or bear leek as well as wild garlic. (In German, Bär means bear and lauch means leek, thus Bärlauch or bear leek.) Whatever the name it is called, its scent drifting in the air in spring tantalizes the taste buds. In North America it grows from South Carolina northwards into Canada. A few days ago when out for lunch with some women friends we discussed this topic. Here, most people treat it as an herb rather than as a vegetable, with just the leaves used. It is milder, thus it doesn't have as strong a taste of garlic, more of a taste enhancer with a decided flavour ot its own. 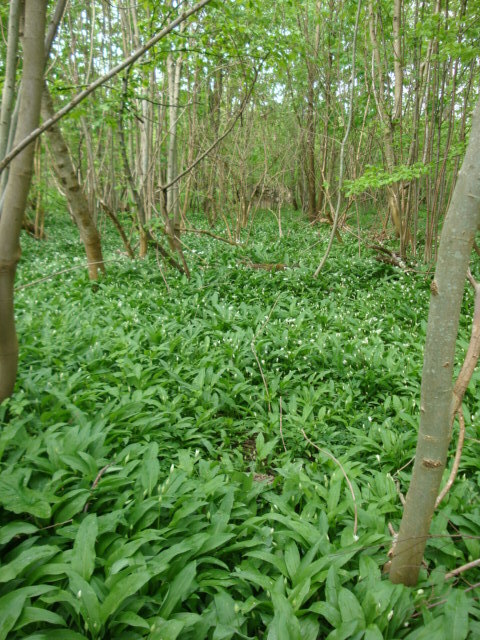 According to John Mariani, author of The Encyclopedia of American Food and Drink, the word ramp comes from "rams" or "ramson," an Elizabethan dialect rendering of the wild garlic. The word was first mentioned in English print in 1530 but was used earlier by English immigrants in the southern Appalachian Mountains. It is considered a spring delicacy and even a reason for celebration. West Virginia is known for festivals and events in its honour. Below, two Bärlauch leaves and part of the root ends. The flavour and odor of ramps is often compared to a combination of onions and garlic, with the garlic odor being particularly strong. Be warned, it is said, if people continue to keep their distance for a few days! Most people here in Germany do not pull the plant out but instead cut off the leaves, which are then used for making soup, pesto or adding to a dish as one would do with parsley. So in that sense it can be called an herb. Dishes containing it would not be as strong in flavour as those using the bulb. In North America the white onion-like bulb is used along with the leaves. The bulb at the root end of Bärlauch is much smaller than the ramp's in North America. Of course, pulling the plant out of the soil means that plant will not grow another year. According to an article on Wikipedia, ramps are considered rare delicacies in Canada. 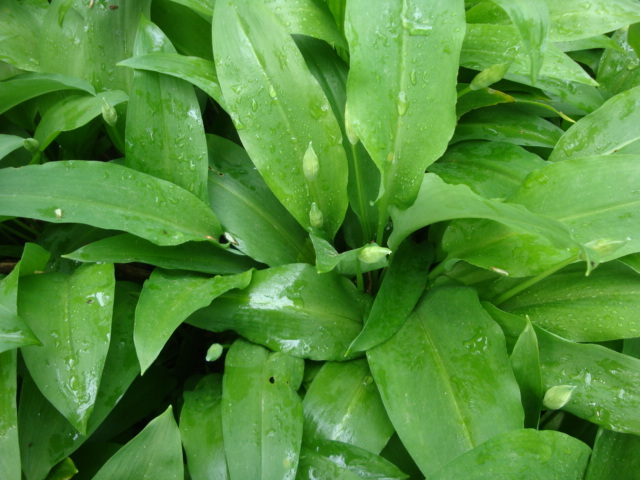 Since the growth of ramps is not as widespread as in Appalachia and because of destruction (pulling the entire plant out of the ground for example), ramps are a threatened species in Quebec and a protected species under Quebec legislation. A person may possess ramps outside the plant's natural environment or may harvest it for the purposes of personal consumption in an annual quantity not exceeding 200 grams of any of its parts or a maximum of 50 bulbs or 50 plants, provided that they are not removed in a park within the meaning of the National Parks Act. This protected status also prohibits any commercial transactions of ramps, preventing restaurants from serving it. Failure to comply with these laws is punishable by a fine. In Ontario ramps may be legally harvested and sold. I know that it grows in Nova Scotia (from my childhood memories most likely also in Prince Edward Island) and other provinces as well. But whether with restrictions or not I am unaware. Ramps are considered a species of special concern for conservation in Maine, Rhode Island and Tennessee. After all of this information about Bärlauch and ramps, how does one use them? Use them in any food that you might flavour with garlic, chives, parsley or other herbs. That means myriad ways. When I was treated with physio a year ago, my therapist said it was delicious cut up finely, mixed with butter and used on steak. We do the same with parsley as do many restaurants here. For garlic butter, we often add finely chopped parsley or Bärlauch leaves to the garlic and butter--wonderful with escargot (Schnecken/vineyard snails). An acquaintance cuts up the leaves and eats it on buttered farm-type bread; I have seen that mentioned as well in German food magazines. You could use the ramps bulbs without any additional garlic. 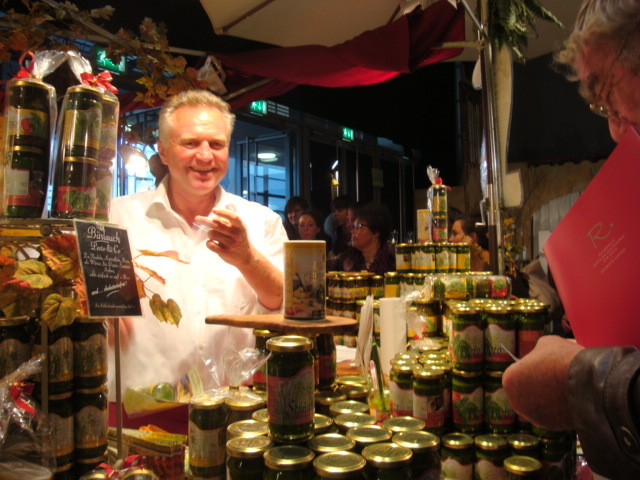 In 2010 Hans and I attended a food fair in the university city of Freiburg, 30 minutes south of us. One of the booths from Bavaria--shown at left--was selling jars of Bärlauch Pesto. Hans bought a jar and used it as a topping for spaghetti, instead of the usual Italian pesto. It was as good as we've ever had. That jar of pesto included almonds (crushed and pureed), so an interesting addition. Bärlauch pesto often includes pine nuts but sometimes cashews, sunflower seeds or hazelnuts (as well as almonds). Italian pesto, of course, is made with basil and pine nuts. Hans is at the right of the picture, looking over the Barläuch pesto jars. The jar on the left was the more expensive one. Its main ingredients were: sunflower oil (47%); Bärlauch leaves (33%); extra virgin olive oil (10%), cashews and sea salt. The jar on the right included Bärlauch (46%); olive oil--cold pressed-- and sunflower oil (no percents given); potato flakes (5 %); sea salt (4%) and lemon juice (1%). A third jar, which I didn't buy and which was larger and cheaper, included the following: Bärlauch (32%); water and plant oil (no percent given); grape seed oil (14%); Italian hard cheese--such as an older Asiago (3.5%); table salt, garlic granules and pine nuts (no percent given for these). Almost anything goes as long as one uses the main ingredients found in the pesto: Bärlauch leaves, oil and salt. At least one of the following is usually also in it and sometimes all three: nuts, lemon juice and cheese. Often garlic is added (with ramps, likely the bulb of the plant). Many recipes call for Parmesan as the cheese of choice. Sunflower oil is often used instead of--or along with--olive oil. In other recipes using Bärlauch (not in making pesto), many of those ingredients plus rosemary, tarragon or marjoram are used. Last year Hans made Bärlauch paste himself and used it to make pesto sauce. All he did was press down on the leaves, along with some olive oil, until he had a smooth paste. Then he added other ingredients to it for the spaghetti pesto sauce. He also froze some of the leaves to use at a later time. You can also freeze them by finely chopping the leaves and mixing them with a little water and then adding them to ice cube trays to be used as a seasoning at a later time. Note J: How to roast pine nuts or almonds: Heat the oven to 375F/190C. Spread the nuts on a baking sheet and bake in the heated oven until evenly golden brown, 5 to 8 minutes. Watch them carefully as you don't want them burned. Rub off any skin. Variation 1: Use chopped almonds instead of pine nuts, roasting them beforehand. Variation 2: Add a chopped garlic clove. Variation 3: Use sunflower oil instead of olive oil or use a combination of the two. Variation 4: Use sea salt and pepper. Method: First, chop the leaves and then place them in a food processor or blender. Add the Parmesan, pine nuts and garlic (if using), along with 2 to 3 tablespoons of the oil. Puree until smooth, scraping down the sides of the processor bowl as needed. With the blade turning, add the remaining olive oil through the tube, pouring it in slowly so the sauce emulsifies and the pesto is of the consistency you wish it. It should be thick and emulsified. Stir in the salt and pepper to taste. The picture at right shows spaghetti with Bärlauch pesto sauce and sauteed bread crumbs. Pesto can be made according to your own taste buds, adding more or less of the ingredients. If you find the pesto to be somewhat bitter, add a little sugar. The most common Bärlauch dish served here is soup. I asked Waltraud, the Wirtin at the Linde in Wallburg--where I go most weeks for chicken--whether she uses the bulbs or just the leaves in hers. She uses only the leaves. I believe that is the same at most--and perhaps all--Gasthäuser here in our area of Germany. Her soup is excellent. This is from the German food magazine essen & trinken, with my translation and wording. In a good-sized pot, heat the butter until hot; add the shallots, garlic and potatoes and saute them until they are steaming and aromatic but not fully cooked, turning them often. Stir in the vegetable bouillon and cream. Season with salt, pepper and nutmeg. Simmer this soup on low heat for 20 minutes. Wash the Bärlauch leaves and cut them into thin strips. Place three-quarters of the Bärlauch in an electric mixer or blender. Add the soup (be careful as it will be hot); cover the mixer and blend until all is pureed. (You can also add the soup in two additions to prevent the hot mixture from overflowing. Puree). Stir in the lemon juice. Taste for seasoning. 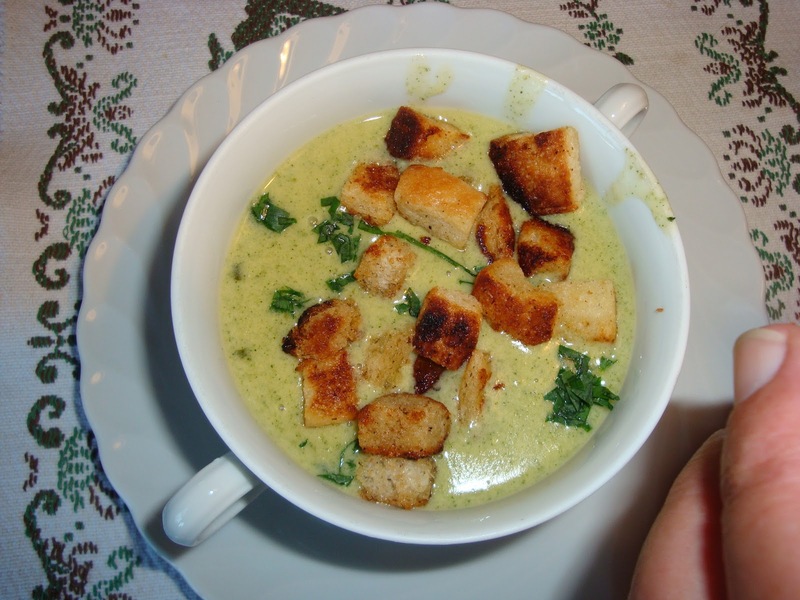 Pour soup into two bowls; garnish with remaining strips of Bärlauch. We usually top ours with sauteed croutons as well, as do some Gasthäuser. If wished, you can add a dollop of creme fraiche or whipped cream before the croutons and slivers of Bärlauch. Bärlauch and ramps are delicious in many different forms. Add them to scrambled eggs, to an omelet or to pancakes; use as garnish over vegetables or in a dip. Discover for yourself the innumerable ways to enjoy this herb and vegetable. These days of spring are just the beginning of all the other good things to come from our gardens and market gardeners. thoroughly enjoying your blog. I too am an aspiring blog writer but I'm still new to everything. Do you have any recommendations for first-time blog writers? I'd certainly appreciate it. I'd really love to be a part of group where I can get feed-back from other experienced individuals that share the same interest. If you have any suggestions, please let me know. Thank you!